APOLLO BEACH, Fla. - June 21, 2017 - PRLog -- OutsidePursuits review editors chose the following camping stoves after extensive testing of cooking time, wind resistance and ease of setup. The Camp Chef Explorer 2-Burner Range stove was found to be the best stove for cooking with its high heat output and large cooking area. Each burner puts out over 30,000 BTUs of heat and with the wind screen makes short work of cooking large meals. With its quality construction and 448 sq inches of cooking space the Camp Chef Explorer easily wins the "Editors' Choice" award. This portable cooking stove is lightweight and made from a steel alloy for long lasting durability. The Coleman Triton is a two-burner stove with each putting out 11,000 BTUs of heat using one 16.4 oz propane canister on high heat. The grill is made from a nickel-chrome alloy for easy clean up. The Camp Chef Camping Oven is the second Camp Chef product winning an award and for good reason. This is the most versatile stove because it also incorporates a small oven for baking. This opens up new possibilities for what goes on the menu. 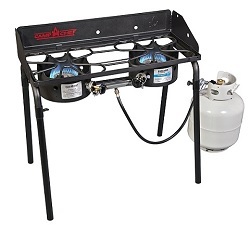 The stove is powered by a disposable one pound propane canister and gets 5 hours of runtime on high.